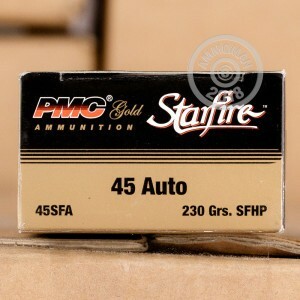 This .45 ACP ammunition from PMC's Starfire series makes a great carry or defense load for a 1911 or other .45 pistol. 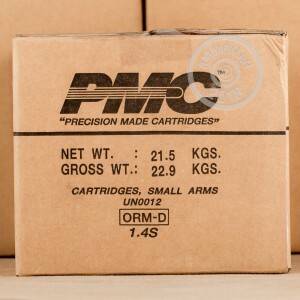 Manufactured in South Korea by a leading defense contractor, this ammunition fires a medium weight 230 grain jacketed hollow point bullet at 850 feet per second. It uses a standard pressure load equally at home in full size and compact firearms. 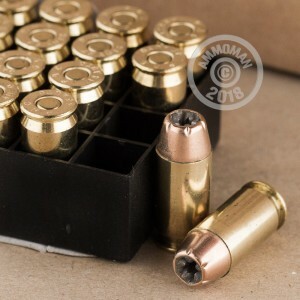 The Starfire bullet is designed to produce high penetration, shoring up one of the .45 Auto's weak points with a ribbed design that carries out a cutting action as the projectile expands. This results in faster incapacitation of an assailant and increases the likelihood of a favorable outcome in a self-defense situation.